Army Gen. Joseph Votel speaks to reporters May 21, 2016 during a secret trip to Syria. A visit by a top U.S. military commander to northeast Syria to confer with Kurdish commanders and plot the next stage in the battle against the Islamic State group has provoked the anger of Syrian rebel commanders, who accuse the Obama administration of giving up on the Syrian revolution. In interviews with VOA Monday, the Syrian rebels warned that the U.S.-led international coalition’s strategy is creating the circumstances for future sectarian violence between Arabs and Kurds by turning to the Syrian Democratic Force (SDF), dominated by the Kurdish People’s Protection Units, or YPG, to liberate Arab majority towns from Islamic State. The warning came in the wake of an unannounced 11-hour trip to Kurdish-controlled northern Syria Saturday by General Joseph Votel, the commander of U.S. Central Command. Votel told Pentagon correspondents who accompanied him that the U.S. had to work with the allies it has on the ground against IS and that the defeat of the jihadist group remains for Washington the clear military priority — not the ouster of President Bashar al-Assad. The SDF's Arab militias, several of whom have checkered histories, at best represent about 20 percent of the total SDF force, which can field about 30,000 fighters. Free Syrian Army (FSA) commanders, however, insist the number of Arab fighters in the SDF is much lower than the claimed 5,000 to 10,000. 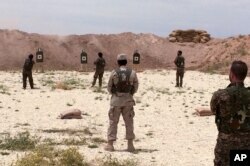 Syrian Arab trainees practice firing their small arms at an undisclosed training range in northern Syria on May 21, 2016. The U.S. attention being given to the SDF is infuriating FSA factions. Rebel commanders also bristle at what they say is the Western media’s uncritical reporting of the YPG, much of it focused on the Kurdish group’s embrace of secularism and the presence of young women fighters in its ranks. “We are getting insufficient supplies form the West both in terms of quantities as well as the type of weapons we need,” says Zakaria Malahefji of the 3,000-strong Fastaqim Kama Umirt, a brigade aligned to the rebel alliance Jaish al-Mujahideen (Army of Holy Warriors). He complained that the FSA is “just being kept on life support” while it is fighting, unlike the SDF. The course of the civil war would have been different if the West had supplied Syrian rebels with anti-aircraft missiles and offered the kind of close air support the YPG has been getting, Malahefji argues. FILE - Gen. Salim Idris, who defected from the Syrian army in July, speaks during an interview in Antakya, Turkey. General Salim Idris, the former FSA chief of staff, told VOA he welcomed any defeats inflicted on IS, but said the U.S.-led coalition risks building up deeper sectarian problems in Syria because of its support for the YPG, the armed wing of the Democratic Union Party, or PYD, which wants autonomy for the Kurds in northern Syria. As the SDF moves against villages and towns that are traditionally Arab, the seeds for conflict are being sown, he warned. He says the Arab element being crafted onto the SDF is seen as being just cosmetic by most Sunni Arabs. “The Arab fighters are just camouflage,” Idris said. “The SDF is the YPG, which collaborates with anyone — Assad, the Russians, the Americans — when it suits its purposes,” he added. FSA rebel commanders accuse the YPG of coordinating with Assad government forces elsewhere in Syria, including in the northern Aleppo countryside, where in February Kurdish fighters overran Arab villages during a Russian-backed regime offensive. YPG officials say the land-grab was to prevent territory from falling into the hands of government forces. The U.S. embrace of the YPG started with American airstrikes to help Kurdish defenders see off a months-long siege by IS of the border town of Kobani in 2015. U.S. support of the YPG increased subsequently as Washington sought to shape a proxy ground force to battle IS, initially setting up a “train-and-equip” program for moderate Syrian rebels. The program failed with rebel commanders declining to join because of Washington’s insistence that the ‘train-and-equip force’ could only be used against IS, and not against President Assad. The Votel visit is likely to rankle the Turkish government, which earlier this year reacted with fury to a 2-day visit to Kobani by U.S. diplomat Brett McGurk. During his visit to northern Syria, Votel said his trip had hardened his belief the U.S. has adopted the right approach to developing local forces to fight the jihadist group. "I left with increased confidence in their capabilities and our ability to support them. I think that model is working and working well,” he said. But Gen. Idris questioned what the U.S. had in mind for the administration of territory seized by the YPG from IS. “Who will control the towns and villages?” he asked. “I raised this question with U.S. officials in the past when they talked about using the YPG but never got a reply. If it is the Kurds, then there will be trouble. I really don’t think the Obama administration has thought this through. Will the Kurds give up Arab towns they capture?” he said.